See that guy? The one with the ridiculous beard? That's Cory Hutchison, and he's the best damn Honda kid out there. I'm sure there will be repercussions for saying that later, but we're going to continue anyway. There's a lot to be said about Cory. If I could pass out a "Personality of the Decade" award, he'd get it, no question. 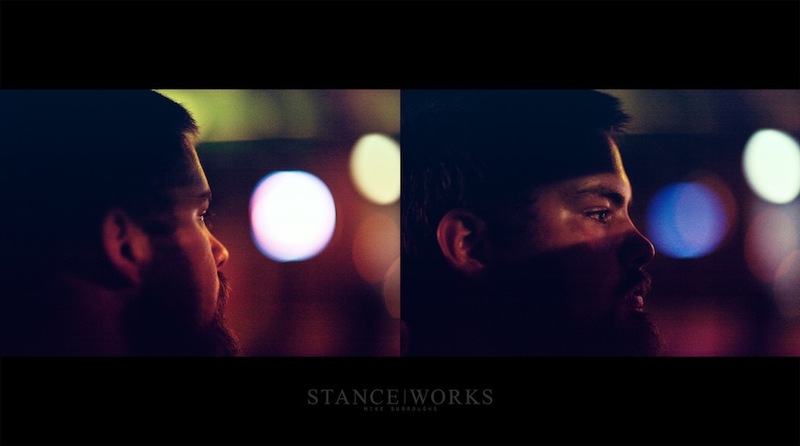 Amongst the hundreds of people StanceWorks has introduced me to, Cory (A.K.A. C-Hutch from this point forward) earns top spot for too many things to count... but first we'll start with Nelson, his interesting 1989 Honda Accord. A) It's low. B) It's low. C) It's really really low. To reiterate, those are not 15s on the car. They're not 14s either. Those badboys are 13x7s, rocking every bit of their 1970s vintage japanese goodness. And it's static. So back to my point: Nelson is one seriously low Accord. Perhaps the world's lowest Accord... in the world? Alright, you get the idea. 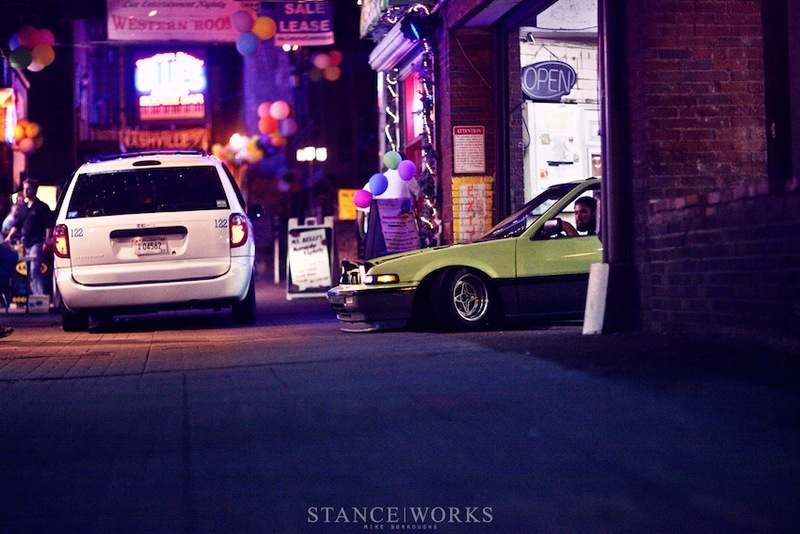 But if being low was all this Accord had going for it, We could stop here. Instead, we're diving into one of the most content-packed SW articles to date, and there is no question that there is neither a car nor owner more deserving. If there was a prelude (get it? Honda jokes all around!) to the experience that is "Nelson," the photo above is just that... Starting with the A/C controls, you'll see that C-Hutch has replaced every button with adjectives that appropriately describe far more than just his car. They describe things like his attitude, his lifestyle, and the scent of his beard. Everything about this car is simply to the nines. It almost doesn't seem real; like it belongs in Toys-R-Us or something. I feel like perhaps I've seen this car in a HotWheels package before. More character than I've ever seen a car have, all coming from yet another dismissed chassis. Some cars are more than the sum of their parts, and this one is one of them. C-Hutch originally bought this car as a daily driver while he was building his 3rd-Gen Prelude, a build many in the 'lude scene envied at the time. 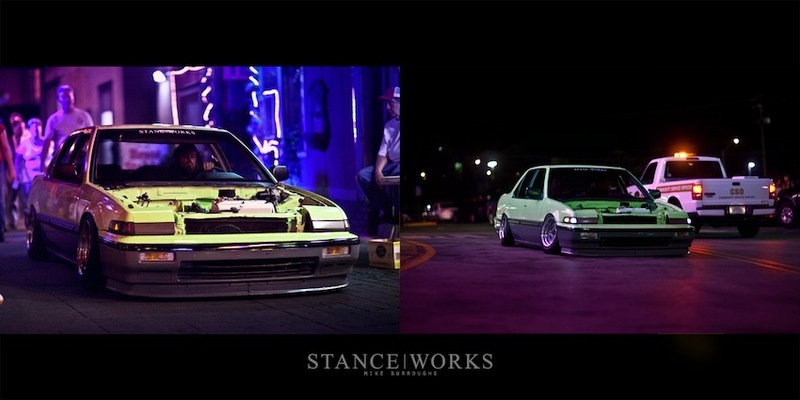 A JDM motor swap, a paint job he did himself, 4-wheel-steering swap, custom suspension, and the like. It was bone stock. For a while, at least. Like many of us, we lose interest in our main build as it grows tiring and familiar. It was reduced from the garage queen to the beater, and 'ol Nelly here slowly got more and more attention. Why C-Hutch put that attention towards an '89 accord is beyond me, but let's not ask questions. The good stuff didn't start happening until he wrecked the car. And by wreck, I don't mean a fender bender. I mean he rolled it on to it's side like a boss. After that, C-Hutch went all-out. Nelson went through an olive-drab on steelies with white-walls for a good amount of time, catching my attention at the Import Alliance Spring 2010 get together. By Summer, the car was burgundy with a white top and matching Diamond Racing Steelies. But it wasn't until I told C-Hutch to "go big or go home" and drive the remaining 10 miles of an evening drive with an empty cooling system, causing him to blow the motor, that got him to truly go wild with the Accord. The first thing on his list was bringing the already low car to more or less subterranean levels of ridiculousness. He then bought the hilariously tiny 13x7 Enkei AP racing wheels from Japan and mounted 155/80/13s on them; the smallest tire he could find. In case you were wondering, the tread width is about the size of my hand. Yes, it's awesome. Also on the list was an engine bay tuck. A bit of a lesson to the kids reading this: This car has a carburetor. Noun: a device for mixing vaporized fuel with air to produce acombustible or explosive mixture, as for an internal-combustion engine. It's that old school stuff. So C-Hutch pretty much removed everything. There aren't any wires. and needless nonsense. And lastly, he busted out the rattle cans and painted it himself. Yeah, you read that right. He rattle-canned this car. Montana Linden Green paint. It's not perfect, of course, but it hasn't even been buffed or sanded yet. 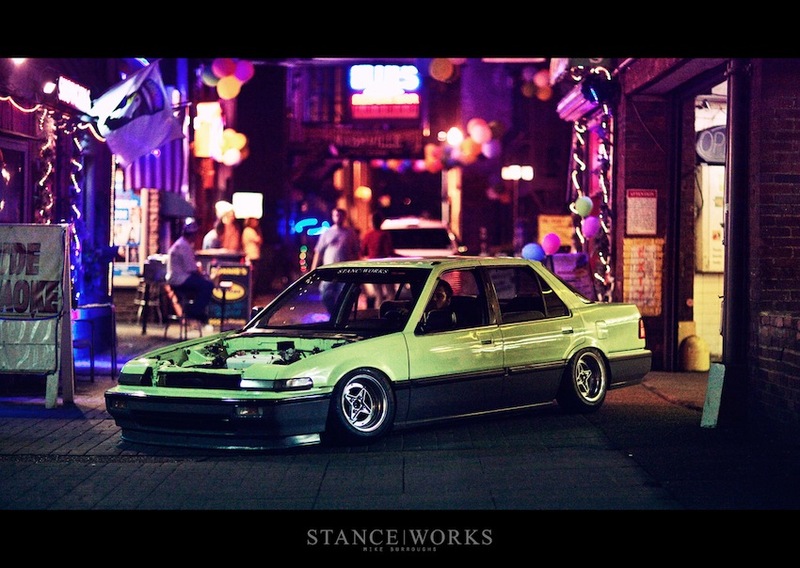 So what we have here is a ridiculously low, ridiculously loud, ridiculously green, ridiculously 80s Accord. And I love it more than words can explain. The only word to describe it is "rad." The best part of the entire car; however, is that it fits Cory "C-Hutch" Hutchison to a T.
You see, Cory is one of those guys you can't help but love. I don't think he has a single enemy. He's almost like a big teddy bear. Including the fur. He's got a personality that matches his car. He's got a smile that could probably cure all of the diseases in Africa. And he thinks for himself. Seeing as he is one of my closest friends, it is within my duties to get him to leave the Honda world forever and join the BMW family. And while I've managed to get him in to an E28, he just won't leave that damn Accord alone. 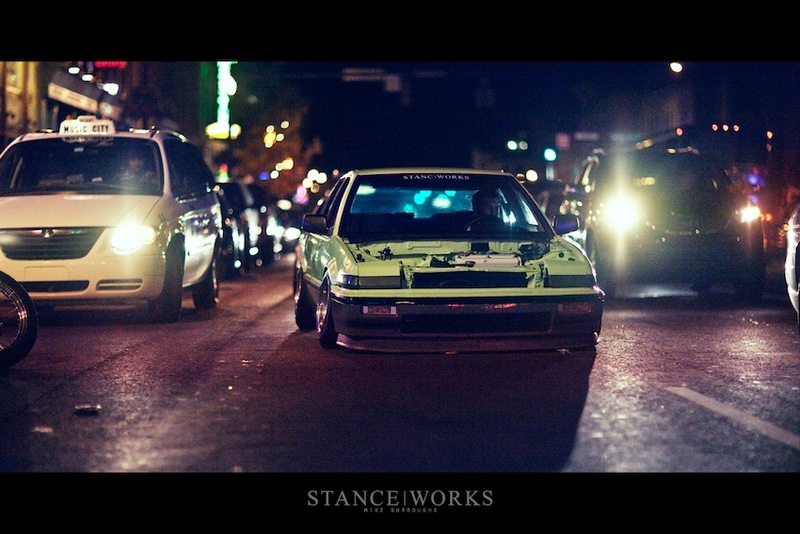 Somehow he took a 1989 Accord and made it one of the coolest cars on the street. He made girls on the Nashville strip hoot and holler at him all night long. Maybe it's the green paint, maybe it's the beard... but if I knew his secret I sure as hell wouldn't share it. And along side building such a unique and individualistic car, Cory is the kind of friend who will help you with anything, whether it's replacing a transmission, or pushing your car a mile down the road after it runs out of gas on a trip to Burger King after telling you "if this trip takes more than 5 minutes I am killing you." Somehow this kid always has a smile on his face... and it's contagious. So here's to someone who represents what this community is all about. Pushing boundaries, ignoring the rules. If someone had told me I'd be posting a rattle-canned bright green two-tone Honda on this page a year ago, I'd have laughed in disgust. But that's C-Hutch for you. You can't underestimate the ludicrous ideas he's always coming up with. I mean really, this car shouldn't be cool. But it is. It's literally the coolest most badass face-smashing neck-breaking make-em-ooze car out there. And it's cutting grooves into the pavement. 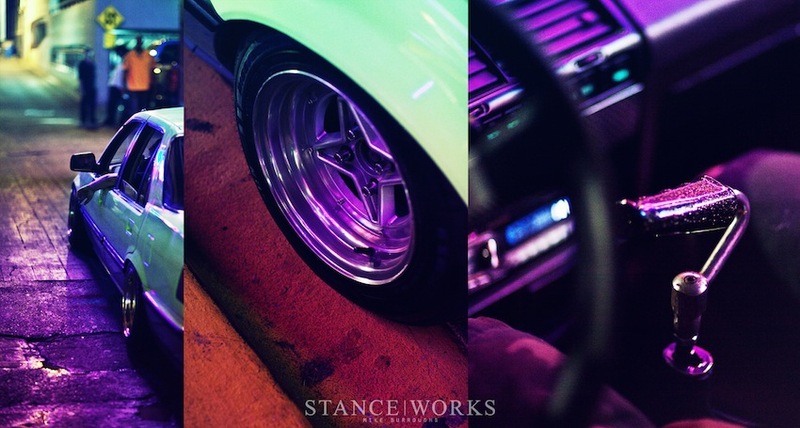 So, StanceWorks, up your game. Let's see what you've got. Comments on The Best Damn Honda Kid, Period. I freakin’ love this thing! 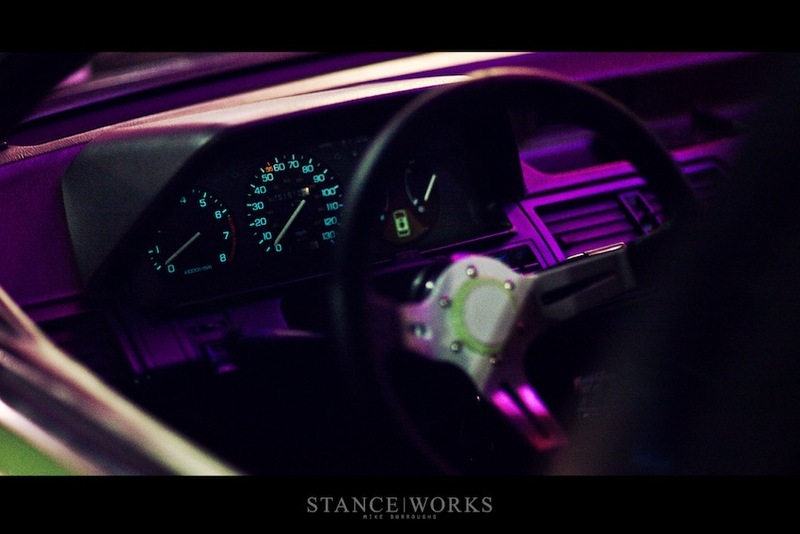 i want that gear stick!!!!! haha thats very cool, we need more people like this guy in the scene! also love how you felt you had too add a description of carbys in the post. I am a big lover of the ol school and it wouldn’t feel right if my baby ran fuel injection.